Please note that there will be no volunteering on the Easter Bank Holiday weekend. So you can come and enjoy Sunnyside without doing any gardening. 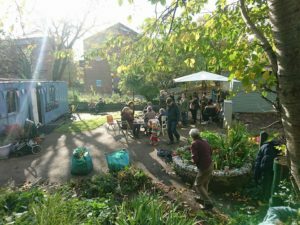 Sunnyside Community Gardens is a massive back garden for local people who live in near by flats with no or very small gardens and it is run by the tiny Sunnyside Community Gardens Charity #1092031. 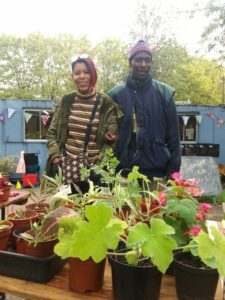 Sunnyside is always open for you to enjoy and three days a week volunteers come in and open up the portacabin so you can pop in and say hello. 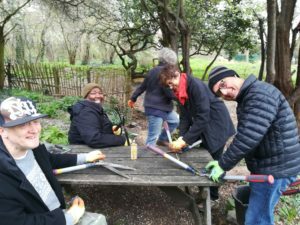 We are looking for new volunteers, there is so much gardening and conservation work to be done, no experience needed but a friendly inclusive attitude is essential. 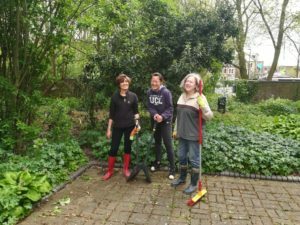 At the moment we have a wide range of volunteers from students, to retired people, to parents with babies, people who work shifts, professional gardeners, people recovering from long term illness, people with disabilities and everyone else too. 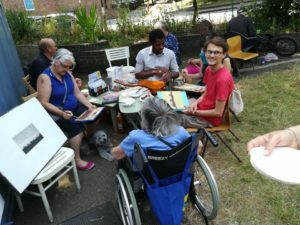 The visitors, users and volunteers at Sunnyside make a really friendly and inclusive community. 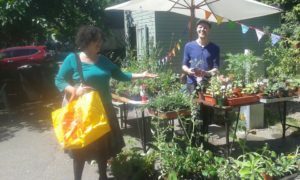 All you need to do to join in, is come and have a chat, fill in a volunteer form and then you can get started on the day that suits you. 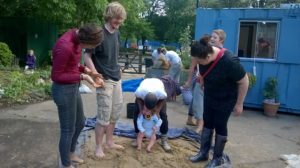 Come and join a new group of volunteers to develop a family friendly area of Sunnyside. This is a great opportunity for you to help make a big impact. 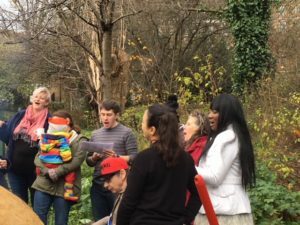 Sunnyside Community Gardens is in Archway, North Islington. 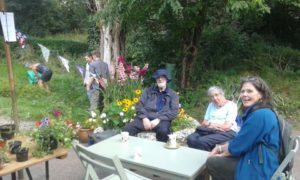 Sunnyside is a very social place and our gardening work is done by volunteers, and we have a volunteer management committee. People are welcome to help out, if you would like to join in come along when we are open and introduce yourself and let us know your interests and get started. 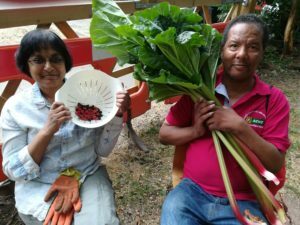 Sunnyside also has a long history of providing therapeutic horticulture for people with disabilities, and those recovering from illness. 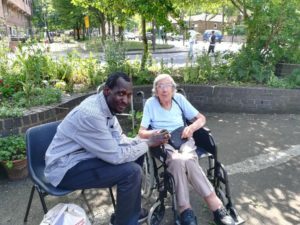 This means we are a truly diverse community with a real mix of local residents involved. 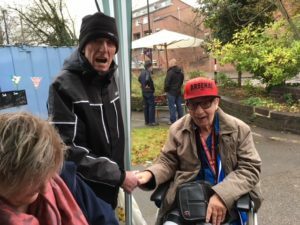 Though you do not need to be an expert in disabilities to volunteer at Sunnyside, you need to have a friendly and positive attitude towards people with disabilities. 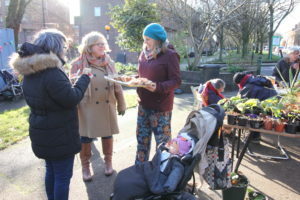 Sunnyside Community Gardens were formed after a campaign by local people in 1977, and registered as a charity in 1992. 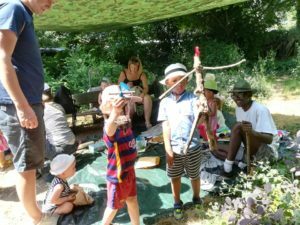 Local residents set up Sunnyside and developed the main site into a beautiful organic garden, designated as a site of importance for nature conservation, with a wildlife pond. Local volunteers still maintain the gardens in all their beauty. 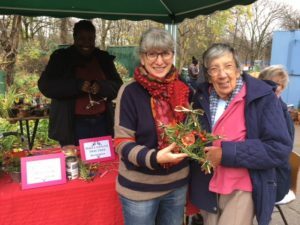 As well as the nature reserve we have a fenced off plant nursery across the road where we grow plants to use in Sunnyside and we also manage the formal Peace Garden in Elthorne Park. 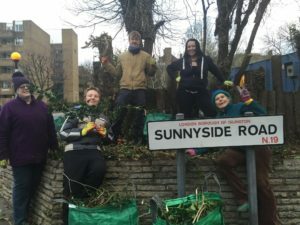 This means Sunnyside is a big and varied garden that is always needs lots of volunteer gardeners to keep it looking its best. 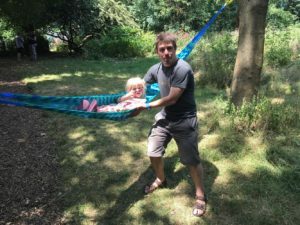 We love our local community and welcome your feedback and suggestions. Use our Contact Us page to let us know how you can help.